What do you call a marketing technologist? There’s a punchline in there somewhere, but I’m partially serious. While everyone is coming around to the merging of marketing and technology/IT — and the value of hybrid roles to lead and operate at that intersection — the titles that people use for these roles vary tremendously. 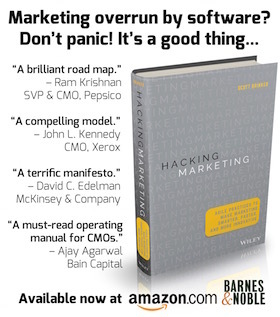 I like the phrase chief marketing technologist (a biased choice, I admit). My annual survey of marketing technology memes for 2012 favored the titles director of marketing technology, marketing technology manager, and vice president of marketing technology. The agency world favors the term chief creative technologist. Forrester advocates for a chief marketing technology strategist. Lines between CIO and CMO are blurring. Today’s CMO needs to view technology as both a delivery tool and as an analytics/measurement tool. The CIO needs to think about build-out Big Data and actionable analytics capabilities to support marketing. Technology is the bridge between the two functions — hence a new title: Chief Information Marketing Officer (CIMO). Conceptually, that’s right on. As far as titles go, I think four word titles have one word too many. But that’s just personal preference. Choose title inspires you and your organization — it’s the mission that matters, not the label. How many possible titles can this produce? Your choices: 7 rank qualifiers, 6 ranks, 3 rank conjunctions, 8 function adjectives, 11 functions, and 10 role nouns. Plus you could have multiple function adjectives and functions — say two of each, so an extra 7 adjectives and 10 functions, plus 2 optional function conjunctions. 7 x 6 x 3 x 8 x 11 x 10 x 7 x 10 x 2 = 15,523,200 possible titles. Want three functions adjectives and three functions? Multiply by another 6 x 9 x 2 for a total of 1,676,505,600. More than a billion. Senior Vice President of Creative Technology and Computational Marketing Platforms? It’s plausible. While I was CMO of WebSideStory we re did my title to CAMO (Chief Active Marketing Officer). That was back “in the day” when CMOs were mostly non-digital (and non active)! A little history. Now were calling these people Content Engineers. I have “Marketing Technology Strategist”, which helps to distinguish from the tactical day to day technology operations. Appears to be working fine, and adding “chief” would like do more harm than help, for my role and our firm’s current environment.